great job, is there anything more perfect than a snow flake? Once you get going the times goes fast. This one really is nice Laurie. I have been having more and more trouble keeping up lately, and I am so far behind with things, so I have been thinking about how I can cut back on this without getting out all together. It has become a part of my life that I enjoy. Your bokeh is fabulous!! So perfect and solid:) I can't believe how close we are to the end too. I'm looking forward to not keeping up with the frenetic pace of a shot a day, but I don't want to lose touch with all the wonderful people I've met on here. @digitalrn I'm having a really hard time keeping up lately too. I love 365 and it really has changed my life, but life is crazy right now. I'm still trying to figure out how to cut back. Just finding the time to take photos is challenging some days, and then the commenting...if you find an answer, please let me know. Love your shot. I have been trying a similar one but never quite looks right and I go with a different photo. I guess pracitice makes perfect. @lorihiro I could never leave completely, LH, because I would miss people like you way too much. Your photos always make me happy, and I look forward to the daily contact with you. We are going to meet in person some day...I just know it. @pwallis How are you going to do year two? I've been puzzling over this for at least a month because I know empty calendar pages are going to make me nuts,. I'm still bothered about the one empty page in the first month I was on this site. But this pace is just too much. @melissapike Thank you so much for telling me about the tag! How funny is it that I gave up on themes long ago because my photos never showed up on the theme pages? I've been labeling them wrong all along! Too funny! What a wonderful graphic -- it would make perfect holiday wrapping paper! I have 17 more days to go. I've already decided that there will be a year 2. I've purposely not posted in my third album just because. Picking up my camera in the morning has become almost second nature for me now. A very striking effect, hope you continue to do a second year. I hope you stay around too, of course! Perhaps it's as easy as cutting yourself some slack on when you take and when you post your shots. 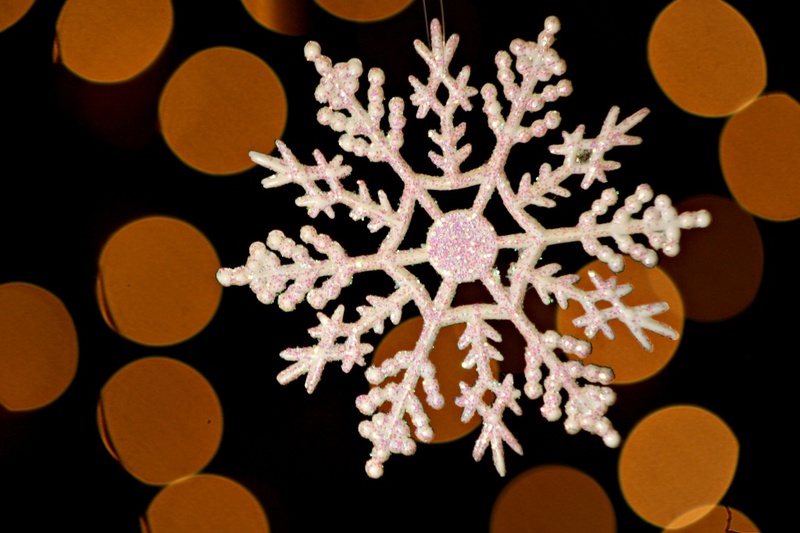 I like your bokeh in today's shot --- and a perfect snowflake to go with it! As someone mentioned, this pic would make beautiful wrapping paper. I don't know how you did that but it is amazingly perfect! Laurie, your bokeh is beautiful. I think I'm going to maybe be a "weekend poster"? Like one lady that I follow? I'm going to have to reconcile myself to gaps in my project, as long as I keep up with posting on the weekend. The thing that's really going to bother me is not keeping up with everyone's shots though. But I've already had to give myself a time limit as to the amount I'm on here each day and just live with the guilt of not catching up with everyone. The way I see it, I don't mind when people get behind on my shots, doesn't bother me a bit, so I'm hoping that everyone is kind of in the same mindset, you know? @tesnonian @carmichaelbev The Christmas light bokeh does take a bit of practice, but basically you need a dark background (in this case my tree) and then my son dangled the snowflake in front of the tree only he was about 10 feet away. He also had a small spotlight on the snowman. I was about 8 feet from him and used my zoom lens and manual focus. Hope that helps. Hi Laurie. Wow so much logistics goes into these shots. This is lovely. I hope you at least do one of those semi-retirement plans so you pop in here n there. @lauriehiggins Laurie this is very striking! It would make an adorable little note card. Your bokeh looks so different (better!) than mine. Great imaginative shot. The bokeh is fantastic. @pwallis That is a great way of looking at it, and I think I'm going to do pretty much the same thing. I will probably start my second year in my Extras album, and post where I left off, so technically the dates will all be wrong, but there will be no gaps. The gaps bother me more than the dates being wrong. I hope that you will continue on, in some form or other. I really enjoy the virtual friendship we have formed. @aj1268 I'm the same way about the gaps! That's the part I can not reconcile. Paula, I've enjoyed our friendship too. It's the relationships that I've made with people like you that make me know I must continue in some form. My family (especially my husband) is a bit weary of the amount of time I spend on here. Beautiful job with the bokeh. Nice to know that even after all this time on 365 you can perfect a new technique. I have NO idea how to do this, but I sure love looking at everyone else's. You did a great job. I'll miss you when you finish! Awesome bokeh on this Laurie! I am SO behind on here. I haven't been taking many pics lately and I am way behind on commenting and I am never going to catch up on it. Who can this time of year? I've gained so much here in the past year, but like you, something has got to give. I think I need to continue, but will have to figure out a better way. @lauriehiggins Thanks for the advice on how to do bokeh. It did help. I lacked the second person but used a fence post with the lights in the back ground. Came out much better. Forgot the black backdrop though! I love sequins and it reminds me of sequin-ish bokeh- deep gold and a snowflake- wow- you are killin it! !